Writing in a new blog post, Rockstar has outlined what's coming next to Grand Theft Auto Online for PlayStation 3 and Xbox 360. The first thing the community will see is coming next week. It's a supplement to the existing event creation tools that currently allow you to put together your own Deathmatch and Race jobs -- with the new update, you'll also be able to create your own Capture events by placing items, defining the skirmish area and choosing what weaponry will be available. Much like with the Deathmatch and Race creators, Rockstar will be keeping an eye on user-generated content and featuring the best creations as "Rockstar Verified" events for others to find, download and enjoy easily. Some of the new cars coming later this spring. Following the Capture Creator comes the High Life update, the chief appeal element of which is the ability to own more than one property on the game map. The update will also bring with it a selection of new jobs, vehicles and weapons as well as an intriguing new "Mental State" tracker. This supposedly gives you an idea of the overall behavior of players in your current session, expressed on a spectrum between "passive" and "psychotic." Whether this will have any impact on gameplay remains to be seen, but if nothing else it may well give players a decent idea of how likely it is they're going to get ganked when they join a new lobby. There's no estimated release date for this update as yet. And there's no estimated release date for the long-awaited cooperative Heists option, either, despite it being one of the main features that drew people to GTA Online in the first place. Rockstar claims the feature is coming "this spring," however, and will allow you to team up either with Crew members or random other players to take on cooperative challenges. There's still no news on how it will be implemented, however; the smart money's on instanced, linear affairs similar to MMO dungeons, but it remains to be seen whether Rockstar will take this approach or something that allows for a bit more freedom and flexibility. As a final note, Rockstar acknowledges that some fans had been disappointed with recent fixes to the vehicle physics that made certain stunts impossible to perform. In response to this, an impending update will restore the original in-air physics for bicycles and motorbikes, and Rockstar notes that it is open to the idea of leaving popular, unintended "glitches" in the game if players enjoy them and they don't impact the game balance or experience negatively. Tagged with GTA Online,	News,	PlayStation3,	rockstar,	Xbox 360. 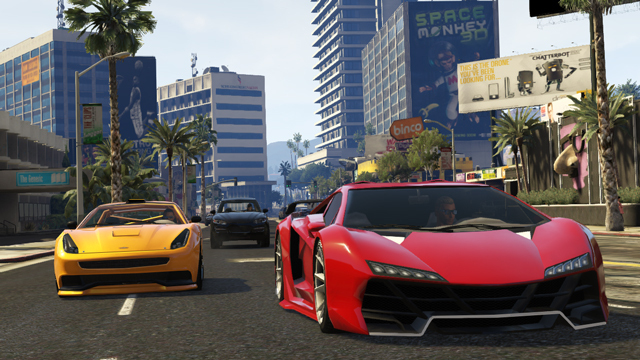 Find out how to use GTA 5 cheats with this handy GTA 5 cheats guide for PS4, Xbox One, PC, Xbox 360, and PS3. Plus details on the best GTA 5 cheats.